At this point, there isn't much that hasn't already been said about Michael Jackson's Thriller. Upon its release in 1982, the album was the smashiest of smash hits, spawning seven top-10 singles... oh, and it's the best-selling album of all-time. Let's just move on. The point here is, anybody with access to a TV or the Internet has likely seen the classic video to Jackson's "Thriller" single, which resurfaces every year around Halloween. The choreography and horror-glam costumes reinvented the music video genre, but countless hours went into the final masterpiece. This video captures some of that hard work. 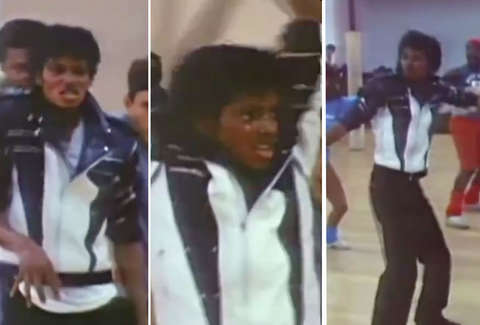 Aside from capturing the laborious process of dance practice, the video displays MJ's subtle charisma; his moves just hinge differently from all the backup dancers behind him. The highlight comes when you hear the track echoing in the dance studio, followed by director John Landis giving a thousand-yard stare from the floor. It's all part of an entire documentary, Making Michael Jackson's Thriller, in case you want to watch the whole "making of." This is all just a minor blip in the schema of MJ's brilliance, but pretty fun nonetheless. Here's the music video for you, just because it's Halloween and "Thriller" will never get old. Ryan Craggs is Thrillist's Senior News Editor. He's never eaten at Fig & Olive. But he does enjoy figs and olives. Sometimes even together. Follow him @ryanrcraggs.